Many have predicted that the traditional personal computer, the one that runs Windows and has Intel inside, is on its way out. There might be an element of truth in that but devices like the Intel NUC DN2820FYKH are proof that there's still life in x86 yet. 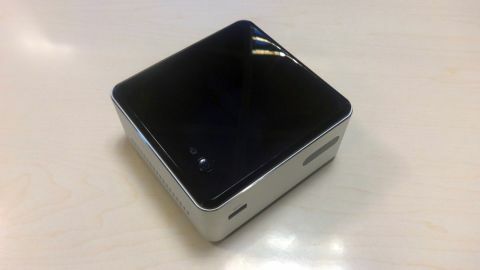 The device I'm testing is an NUC or what Intel calls Next Unit of Computing. TechRadar has reviewed one in the past and since then, their numbers have increased significantly to 10, an indication of their growing importance in Intel's grand plan. This model, nicknamed Forest Canyon, is the cheapest in its portfolio and, while it won't set the world on fire, it is targeting an enthusiast market somewhere between the Raspberry Pi and a full-blown computer. They're computers, but not your beige tower type. Even the box it was shipped in is different from what I'd expect from a PC. It's colourful, almost cubic and is about as voluminous as a pack of 10 stacked CD boxes. The Intel NUC DN2820FYKH kit (bare unit) is on sale at Ebuyer for under £96.99 (about $160, AU$180) but you should be able to get it for marginally cheaper elsewhere (NB: since we reviewed it, the price went up by 30%, but you can find cheaper deals by searching around). You will need to add a memory module, an operating system and a hard disk drive (plus the usual peripherals) in order to get a fully functional computer. The actual product is a 4.6 x 4.4 x 2-inch (116.6 x 112 x 51.5mm) brick that sits comfortably on one's palm. Intel describes the enclosure as "a silver aluminium ring with a diamond cut around black top". That top facia is also glossy and houses a flush power button while two dozens of holes on each side of the device ensure that the machine is properly cooled. Sadly though, even if the computer is housed in an aluminium enclosure (essentially acting like a heat sink), this 7.5W processor still needs a fan to cool down. Not a big deal but still something to bear in mind; this is no fanless PC. The other thing you notice about the DN2820FYKH is its weight. It is light, indeed it's very light and weighs well under 1kg with its plug/power supply unit, system memory and SSD plugged in. Other than the 36W adapter (and an assortment of plugs), the NUC ships with a VESA mount bracket (75 x 75mm and 100 x 100mm compatible) and a couple of leaflets. Oh and it comes with a three-year warranty.